EVERYTHING WE learned about penguins turns out to be wrong. They're not "pompous, waddling birds of crime," as Batman's Chief O'Hara would have it. Nor are penguins actually from Hoboken, as many Bugs Bunny fans believe. March of the Penguins follows the pathetically moving mating cycle of Antarctica's emperor penguins. Viewers will make noises they haven't made since they were unwrapping their birthday presents when beholding fleecy, apparently smiling penguin chicks toddling and flapping their little vestigial wings. There was, however, nothing cute about the filming conditions: 80-degrees-below-zero temperatures, against sometimes 100 mph winds. The emperor penguin's life cycle is depressing to us underachievers. First, a bracing 70-mile walk. In an orderly line, the penguins bobble away to the breeding grounds. There, they stand around in their evening clothes, clearly uncomfortable and not properly introduced to one another, like characters in a downbeat British play. Eventually, the penguins find common ground for conversation and pair off for torrid mating. "They're monogamous, sort of," says our molasses-toned omniscient narrator Morgan Freeman. (If someone makes a documentary about Morgan Freeman, who will narrate it?) The uncensored footage of the male beaking his lady-friend's throat feathers ought to clear the theaters in Salt Lake City. The ice provides the best light reflection possible for the filmmakers. True to their names, these penguins are imperially handsome. Their oily feathers gleam like freshly laid fiberglass, and their old-gold colored sideburns are burnished by the wind. When the frost gets them, spotting their livery with pinpricks of ice, they're even prettier, as if they had rhinestones on their midnight-black hides. Unfortunately, the narration shamelessly anthropomorphizes the ice birds. "It's a story of love," burrs Freeman. It's actually a story of instinct, which may be even more pure and beautiful, considering the wrongs done in the name of love. Supposedly, the original French version laid it on thicker, with methods that can be imagined by those who recall the baby moans dubbed into Jean-Jacques Annaud's The Bear. 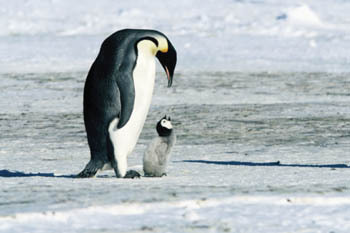 Still, the dubbed chirruping of the penguin chicks sound suspiciously like meadow birds. At one point, we're told penguins have been on the ice "for millions of years" and then at another point, "for centuries." A predatory auk or something flies down on a chick, and we never find out what kind of bird it is. Apparently, Mr. God-like Know-It-All Freeman doesn't know everything, does he? March of the Penguins (G; 80 min. ), a documentary by Luc Jacquet, opens Friday at selected theaters.